MDLIVE, the nation's leader in the rapidly growing virtual health market, today announced that it has released MDLIVE 3.0, a new mobile development framework supported by an enhanced software development kit (SDK). As part of version 3.0, the company also announced a new Android mobile app featuring a major user interface redesign, streamlined navigation and improved performance. "We are seeing significant growth in the number of patients that use a smartphone to connect with MDLIVE so a robust development framework and mobile app is essential,” said Randy Parker, CEO MDLIVE. MDLIVE’s new mobile development framework provides significantly improved development flexibility and scalability. As are result, it is faster and easier for MDLIVE clients such as hospitals, health systems and health plans to launch their own “Powered by MDLIVE” telemedicine mobile applications built on the MDLIVE framework. The company’s mobile software development kit, available since Q2 last year, has also been enhanced, making it easier for clients to embed the MDLIVE workflow into their own branded mobile apps. 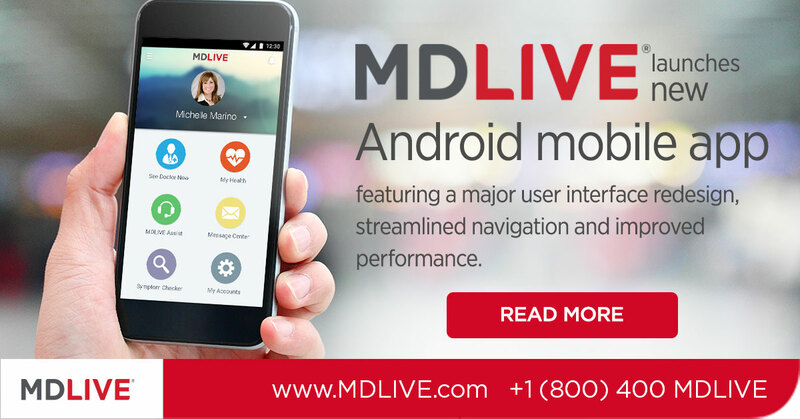 As part of 3.0, MDLIVE also launched a new Android mobile app on February 22, 2016. Previous versions were based on a hybrid architecture and as a result different views within the app were fueled by the company’s website. In contrast, MDLIVE 3.0 is a native app and has been specifically designed for a mobile operating system. All functionality is embedded within the app making it easier to develop new features, many of which can access and utilize capabilities already built into the smartphone operating system, such as the camera. Future enhancements will include the integration of Breakthrough, MDLIVE’s behavioral health service into the MDLIVE app, providing users with the option to schedule and consult with a therapist or doctor. MDLIVE 3.0 for Apple IOS was released in December 2015 and can be downloaded from the Apple App Store. MDLIVE 3.0 for Android was released February 22, 2016 and can be downloaded from Google Play. With MDLIVE, consumers can visit with a doctor 24/7/365 from their home, office or in the go. MDLIVE’s network of Board Certified doctors have on average 15 years of experience practicing medicine and can provide non-emergency medical and pediatric care to assist patients with: allergies, asthma, bronchitis, cold & flu, constipation, diarrhea, ear infections, fever, headache, infections, insect bites, join aches, nausea, pink eye, rashes, respiratory infections, sinus infections, skin infections, urinary tract infections and more. MDLIVE will present live demos of virtual consults with its board-certified physicians at its booth at the HIMSS 2016 Conference & Exhibition, February 29 - March 3, at the Venetian/Sands Convention Center, Las Vegas, NV at booth #12026, Hall G.
Founded in 2009, MDLIVE is a visionary and pioneer in the digital delivery of high-quality, convenient, cost-efficient care. The company provides consumers, health plans, health systems and self-insured employers with 24/7/365 access to Board Certified doctors, pediatricians and licensed therapists via secure online video, phone or the MDLIVE App. Instead of the inconvenience and expense of ER or urgent care visits for non-emergency issues, registered users can receive a virtual consultation through the company’s HIPAA and PHI-compliant secure, cloud-based platform from home or on the go, and if necessary, obtain an e-prescription. 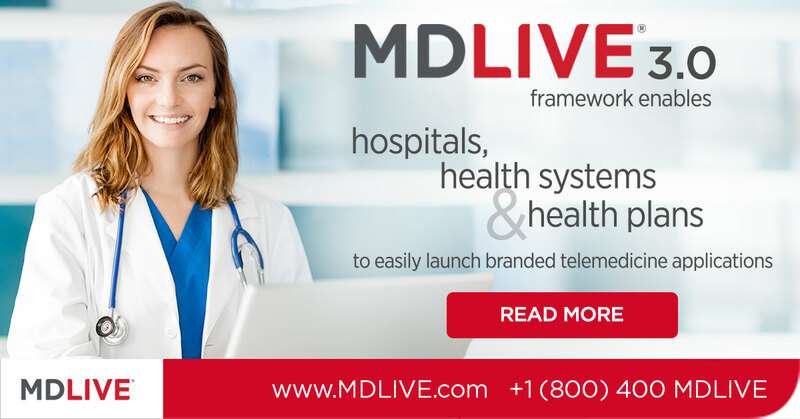 To learn more about how MDLIVE is using telehealth innovations to improve the delivery of healthcare, visit http://www.MDLIVE.com.